It is the Baseball Hall of Fame induction week. A week where we celebrate the new batch of baseball immortals and their careers. As each year passes it seems more and more people with large impacts on the game slowly pass to the side, never to get their due. Today’s book showcases one of those personalities of the game that love him or hate him, you can not deny the changes he generated in Major League Baseball. Growing up in humble beginnings in Brooklyn, New York, Marvin Miller was not a person you would expect to have such an influence on the sport of baseball. Well educated and professionally schooled outside the sport, he took the opportunity in his career to make a mark for himself in the real world. Miller used his professional knowledge and education to build one of the strongest unions within pro sports and upset the owners apple cart. Robert Burk takes an in-depth look at Marvin Miller in this book. You get a lot of personal information about Miller that helps see how his own experiences and life events helped shape his personality and effect his business dealings. It also shows the fortitude that was a Miller trademark, was forged and how the players were able to benefit from it. This book offers a very complete picture of Marvin Miller both in front of the camera and behind the scenes. I was always familiar with his MLB dealings with the players union but this book put forth a personal dimension to Miller that is sometimes missing when he is the topic of conversation. Most of the time in my opinion he is portrayed as a ruthless union organizer that was just after the almighty dollar for his members, so this definitely put a different spin on him for me. 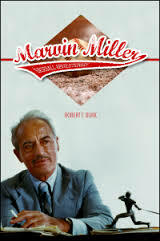 Now the twenty million dollar question………does Marvin Miller deserve to be in the Baseball Hall of Fame. Well, for my dollar I say a resounding YES! Take away any personal opinions you have on the man himself and take a look at the actual changes he helped institute within the game. Yes, money has increased to insane amounts and sometimes the players are glorified children at times, but he has gotten them better working conditions, pension increases as well as increased safety initiatives. While only remembered for the money aspect, he has helped usher in positive changes for both the players and the game as a whole. Now, back to the question will he ever get in the Hall? That I am not so sure of. It seems people in baseball have long memories and are able to hold some serious grudges. As more time passes by, the odds diminish but hopefully some day he gets in where he deserves. This book is not a light read by any means. You do have to pay attention to what you are reading or you will get lost. The details in labor law is something that will confuse the reader if they don’t watch, but still is a vital component, and those heavy subjects are needed to tie the entire story together. Baseball fans will enjoy it so give it a chance even when the big words get you discouraged. The reader gets rewarded for their work in the end.